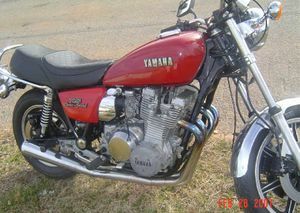 The Yamaha XS Eleven/XS1100 motorcycle was produced by Yamaha from 1978 to 1981. It was a superbike powered by an air-cooled 1102cc 4-stroke, DOHC inline four-cylinder engine mounted transversely in a duplex cradle frame. 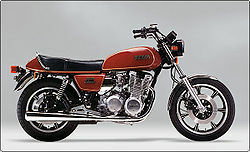 At the time of it's release in 1978 the XS11 was the fastest production motorcycle in the world. It was supposed to be an Eleven second bike hence the Eleven name instead of 1100. There were three models: the standard style XS Eleven, factory custom XS Eleven Special, and XJ1100 Maxim. The standard model, first released in 1978, had a larger, 5.4 gallon tank than the special's (1979 and up) 4.5 gallon tank, as well as a larger rear tire and wider handle bars. The special had "buckhorn" style handlebars and a leading front axle, giving it more of a cruser look. In '80 and '81 Yamaha offered a "Midnight Special" version (all across the XS line) with a black tank (with gold flakes) and gold trim/side covers/wheels. 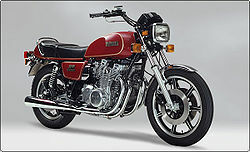 The XS Eleven made its debut in 1978 as the largest capacity Japanese superbike then currently in production. It featured dual front disc brakes, a rear disc brake, shaft drive and cast wheels. A "factory custom" styled XS Eleven Special was released along side it in 1979. Both models were superceded by the 1982 XJ1100 Maxim. The first "Midnight Special" model. Black bodywork and components that included an exclusive black chrome process, gold plating and black wrinkle finish. This page was last edited on 23 November 2010, at 19:11.